New York Cross Country Skiing in the Adirondack, New York 6 million acre park around Lake Placid, Saranac Lake, Glens Falls, Old Forge, Lake George etc..
and resource center for the Adirondack Region and upstate NY! Cross Country and Telemark Skiing! 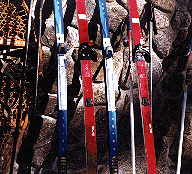 Telemark skiing is an multiskiing discipline that includes telemark turns, skating sections and jumps. The turns require that the heel of the boot not be attached to the ski (thus the terms, free heel skiing). Telemark skiing uses boots and bindings specifically designed to allow this turn. Telemark skiing was named after a region in Norway where the skiing pioneer Sondre Norheim founded the turn over one hundred years ago. 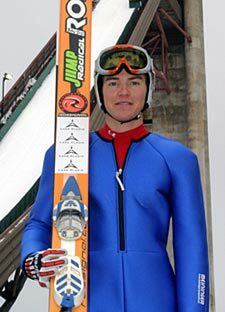 Billy Demong is a local American Nordic combined skier and Olympic gold medalist. Demong is a four-time Olympian competing in Nagano, Salt Lake City, Torino and Vancouver. Demong has been competing on the world cup level since 1997. Demong learned to jump through the New York Ski Educational Foundation (NYSEF). He attended the National Sports Academy National Sports Academy (Lake Placid, New York) during high school, and competed in the Nagano Olympics during his senior year. Get peace of mind when booking a ski get away!